This product has been discontinued by the manufacturer. Feel free to Contact Us with questions or concerns regarding replacement products. The FRD-1201U is a rugged radio remote control system designed for use in industrial applications such as telescopic boom cranes and lifts, concrete boom pumps, boom trucks, construction equipment, tower and knuckle-boom cranes, conveyors and much more. 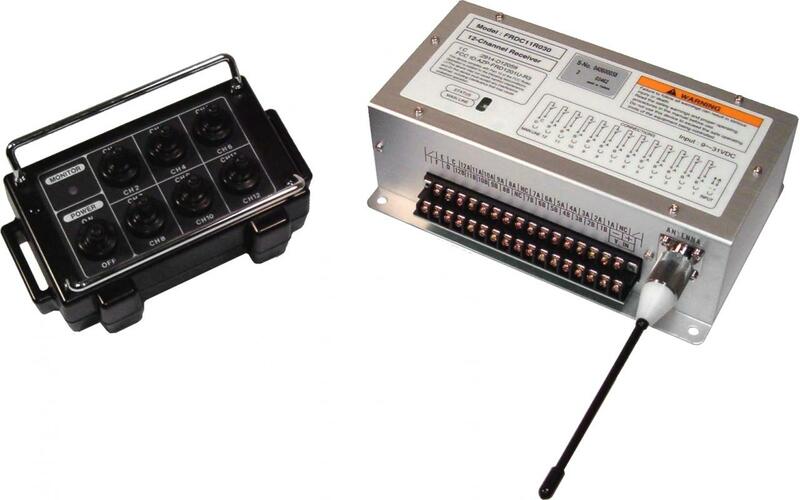 The transmitter provides medium to long range remote control of 12 internal receiver relays (plus a main-line relay). Both transmitter and receiver utilize state-of-the-art surface mount component technology to minimize size. The transmitter incorporates advanced power saving features for extended battery life. Channel Watch® search and select technology, a 16-bit identification code, and 40 synthesized channels, give the system superior reliability and immunity to false activation from RF interference. This also allows multiple FRD systems to be operated independently in the same area. The transmitter has an injection molded case of high impact material, gasket seals for durability and water resistance, an internal antenna, and toggle switches that are double sealed with o-rings and a durable rubber boot, making it ideal for use in harsh industrial environments. The receiver is packaged in a compact, rugged aluminum case allowing it to be mounted in enclosures and other areas where space is at a premium. Download documentation for this product. Dimensions 4" x 7" x 3"